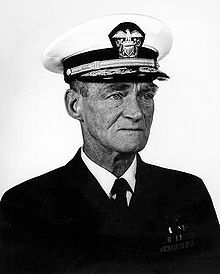 USS Mitscher was named for Admiral Marc Andrew Mitscher. He was born on 26 January 1887 in Hillsboro, Wisconsin and graduated from the US Naval Academy on 3 June 1910. Mitscher served in various campaigns during WWII. Of significance was his command of USS Hornet (CV8) as Capt. Mitscher when, on 1 April 1942, an unprecedented event of loading modified B-25B, medium-range, Mitchell Bombers onto the flight deck of carrier occurred. 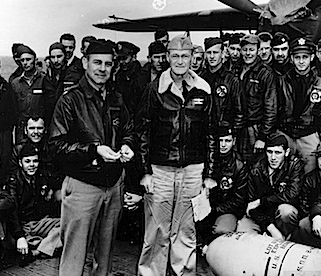 The launch of those bombers against Tokyo on 18 April 1942 became known as the “Doolittle Raid.” In 1946, Mitscher returned to the U.S. to serve as Deputy Chief of Naval Operations for Air Service. He served briefly as Commander, 8th Fleet, and on 1 March 1946, he became Commander-in-Chief, U.S. Atlantic Fleet with the rank of admiral. While serving in that capacity, he died at Norfolk, Virginia on 3 February 1947. USS Mitscher had a displacement of 3,676 tons and was 493 feet long with a beam width of 50 feet and a draft of 13 feet 10 inches. She could attain a speed of 30 knots. Her armament consisted of two 5-inch and four 3-inch gun mounts, four 21-inch torpedo tubes, ASROC, and one depth charge track. Her crew comprised 403 officers and enlisted men. She was the lead ship of the four Mitscher class Destroyer Leaders built. USS Mitscher's keel was laid down as DD-927 on 3 October 1949 at Bath Iron Works Corp. in Bath, Maine; re-designated DL 2 on 2 February 1951; she launched on 26 January 1952 sponsored by Mrs. Marc A. Mitscher, widow of Admiral Mitscher; and was commissioned 15 May 1953 with CDR Terrell H. W. Connor in command. On 20 September 1958, she had the honor of taking President Eisenhower and his presidential party and guests out for the start of the America's Cup Race off Block Island, RI. On 9 February 1961, she departed her new homeport of Charleston, SC and steamed to the Mediterranean Sea for her first eight-month tour with the 6th Fleet. Such deployments over the next four years involved her in further NATO exercises as well as 6th Fleet exercises. In August 1964 while in the Mediterranean Sea, she stood off the island of Cyprus during the Battle of Tylliria to aid in the evacuation of American nationals then steamed through the Suez Canal to patrol the Red Sea and Persian Gulf. After another shakedown cruise in Guantanamo Bay that ended on 31 August 1964, her homeport became Newport, RI. She conducted exercises off the east coast until 3 January 1966 then sailed on a goodwill cruise to England, Germany, and France before returning to RI 10 February. For the next six years, she continued her east-coast operations with deployments annually either to the northern or eastern Atlantic for NATO exercises. 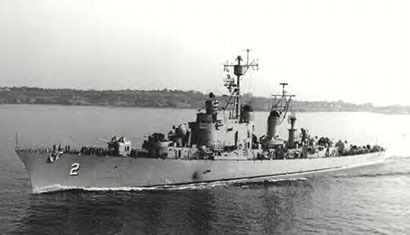 On 2 March 1966, USS Mitscher departed Newport for the Philadelphia Naval Shipyard. There, on 18 of March, she was decommissioned for conversion to a Guided Missile Destroyer, DDG 35. She was re-commissioned on 29 June 1968. After sea trials and shakedown exercises off the east coast, she reported to DesDiv 182 for duty in the Atlantic Fleet. 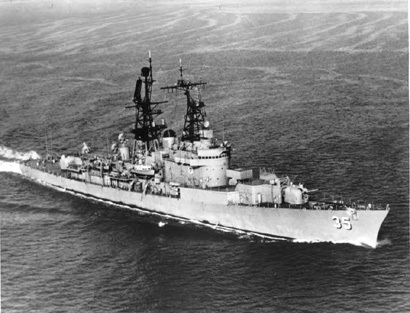 USS Mitscher (DDG 35) was decommissioned on 1June 1978. It was 25 years after her first commissioning.